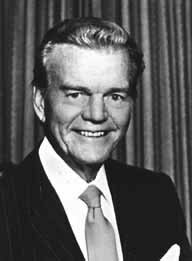 Paul Harvey first went on the radio in 1933, when he was still attending high school in Tulsa, OK. Hard work, a smooth baritone voice, and his mastery of the dramatic pause earned Harvey quick advancement at a series of radio gigs across Kansas and Missouri. At KXOK-AM in St. Louis, he met Lynne 'Angel' Cooper, the station's "women's news" reporter. He proposed over dinner on their first date, and she became his wife, producer, and editor. Harvey was a newscaster at Chicago's WENR-AM, where he began his daily Paul Harvey News and Comment for ABC Radio in 1951. Harvey's commentaries often tilted to the right, and he read the commercials as enthusiastically as the commentary. "I am fiercely loyal to those willing to put their money where my mouth is", he said. In 1976, Harvey started a second daily radio show, The Rest of the Story, telling little-known true anecdotes about famous folks or historic incidents, always with a little surprise at the end, though rarely surprising. The Rest of the Story was written by Harvey's son and announcer, Paul Aurandt, Jr. Behind Harvey's folksy demeanor, his commentary occasionally revealed perspectives on the conservative extreme. In a 2005 on-air statement, for example, he seemed to wax nostalgic for slavery and biological warfare, and plainly suggested that America should have used nuclear weapons in its wars against Afghanistan and Iraq. After his death, Harvey's FBI file revealed a long correspondence with FBI Director J. Edgar Hoover, and that for many years Harvey had voluntarily submitted his scripts for the FBI approval before broadcast.